During autumn and winter 2018 Fusion Arts worked with eleven primary schools, two secondary schools, three community groups, and ten artists to deliver lantern workshops in schools and community settings. Artists and groups worked together to create designs and make lanterns on the festival theme of ‘Undiscovered Oxford.’ In addition to the artist led workshops, some teachers attended a Twilight session where they learnt the skills to design and make lanterns with their class. 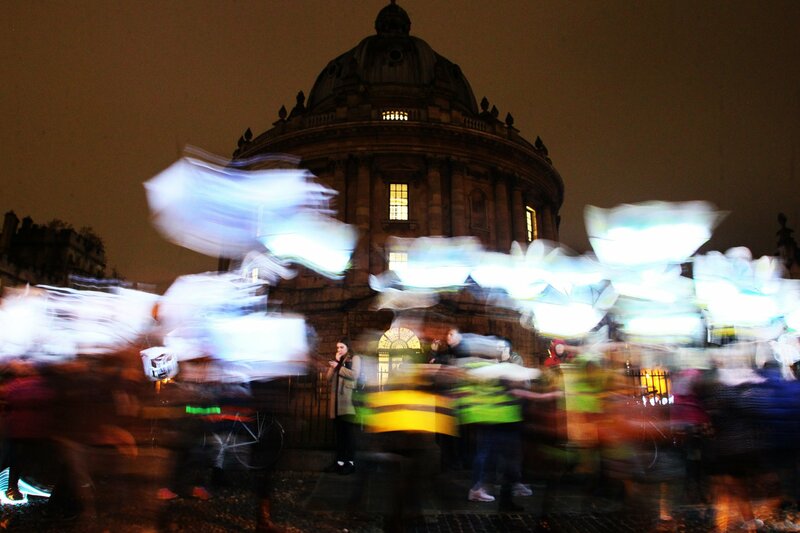 On Friday 16th November a cacophony of light and creativity wound its way through the magical streets of Oxford to cheering crowds. The designs included a towering king inspired by Arthurian legend, glowing astrolabes from History of Science Museum’s Islamic instruments, a ghostly canoer inspired by the on the history of Oxford’s Subterranean Trill Mill Stream, transformers from film sets and spooky castle turrets. On Saturday 17th November Fusion Arts took over an empty shop to run an open pyramid lantern workshop for the community to attend. Christmas Light Festival 2018 was produced by Oxford City Council and Ian Nolan Events.